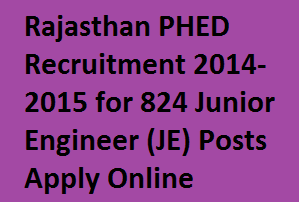 Rajasthan PHED Recruitment 2014-2015 for 824 Junior Engineer (JE) Posts : The Public Health Engineering Department (PHED) of Rajasthan is Released 2014 and 2015 New Notification for Recruit Candidates for 824 Vacancies of Junior Engineer (Degree and Diploma) of Civil, Mechanical / Electrical Department Posts. So All Eligible Interested Candidates Read Full Details about Qualification, Age and Apply Application Form at Online Official Sits is www.jenexamphed.rajasthan.gov.in last date for apply is 27th November, 2014. Qualification : The Educational Qualification is Qualified Degree in Civil Engineering, Mechanical / Electrical Engineering Departments. See Full Details about Qualification on Notification. Age Limit : The Age is Between 18 to 35 Years Candidates Only Eligible. Application Fee : The Application of Examination Fee for General & OBC (Creamy Layer) Candidates Have to Pay 1500/- and Non Creamy Layer OBC Candidates Pay 750/- and ST / SC Candidates are Pay 375/-. See Full Details about Fee in Notification.